When you patent a product it means you have received recognition that your invention (not an idea) is new, unique and useful. A patent gives you the right to prevent others from making, using, selling, promoting for sale, or importing your invention in the country where your patent was issued. Governments issue patents subject to their existing laws and according to their rules and regulations. In the United States, for example, the recognition comes from the United States Patent and Trademark Office. A patent is issued for 14 or 20 years depending on the kind of patent. We live in a global economy where products are manufactured, shipped and marketed around the world - so to prevent others from making, using, selling or promoting for sale your invention in other countries - you must obtain a patent in those countries. Only an inventor may apply for a patent and they can do so in any country despite their citizenship. Every country has its own patent laws, however, many countries co-operate with each other regarding patents through international treaties. These international agreements allow you to apply for a patent in one country and to subsequently apply to other countries, within a prescribed period of time. In other words, you have a timeline to follow once you apply for a patent in one country and decide to widen your patent protection around the world. This allows you, with your investor(s) and/or licensee, an opportunity to assess profitability worldwide before patenting worldwide. A patent attorney or agent is familiar with these agreements and network with lawyers or agents throughout the world for the purpose of obtaining patents in other countries. Patents are issued not only for new inventions but also for new and useful improvements to existing inventions. About 95% of patents are for improvements to existing inventions. You cannot patent a product if it was invented by someone else but never patented. You cannot patent a product that was known or used, publicly disclosed or printed in a publication in any country more than one year prior to your application. You cannot patent a product or an improvement to an existing invention that is obvious to anyone familiar with the area of your invention. You cannot simply substitute material or change the size and expect to get a patent. However, this is why it is important to consult a patent attorney or agent on such matters once you have completed your preliminary preparation. 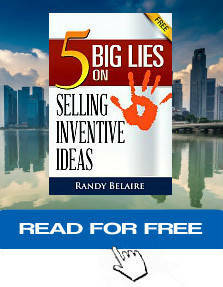 For more detailed information about using patents you can get a FREE copy of Five Big Lies - Selling Invention Ideas, which is on this page. Inventions typically evolve from an idea to a new, unique and useful product. If you publicly disclose your invention more than one year prior to filing for a patent application you will not be issued a patent. These tools are used to evolve your idea into an invention that can be patented for profit. Successful inventors will utilize these tools to evaluate the potential profitability of their inventions and to prepare for a further comprehensive patent search by a patent attorney or agent - before seeking investment or spending thousands of dollars for a patent.